For most of us we didn’t need a proclamation, but how fun is it that it is all nice and official like. It sort of mandates the fact that we cannot go the day without sampling at least one platter of gravy soaked fried meat. 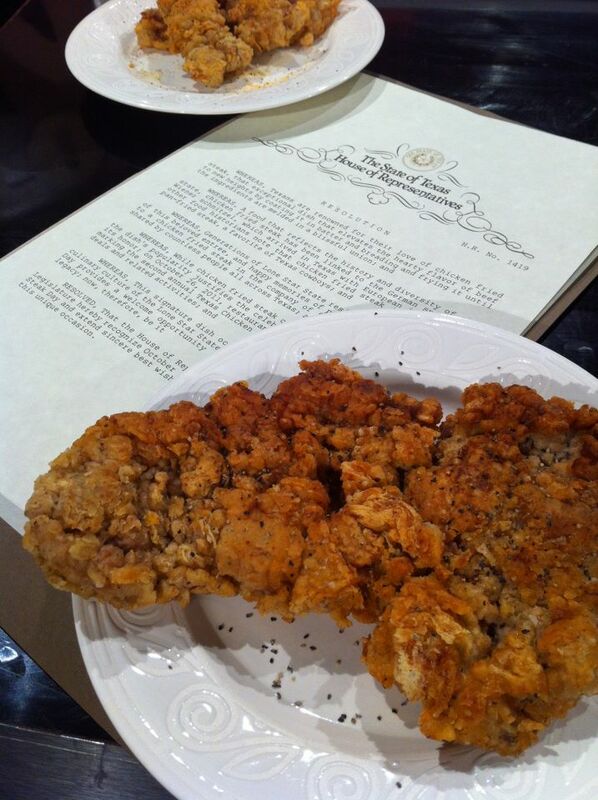 In honor of this auspicious day we bring you several of our favorite chicken fried steaks in the Dallas area. Celebration is known for their over-the-top home cooking served with three sides. And if that is not enough, they are eager to refill your plate. The Chicken Fried Steak is legendary at this 41 year old Dallas institution. Babes Chicken Dinner House is mostly known for their chicken, but we know better. 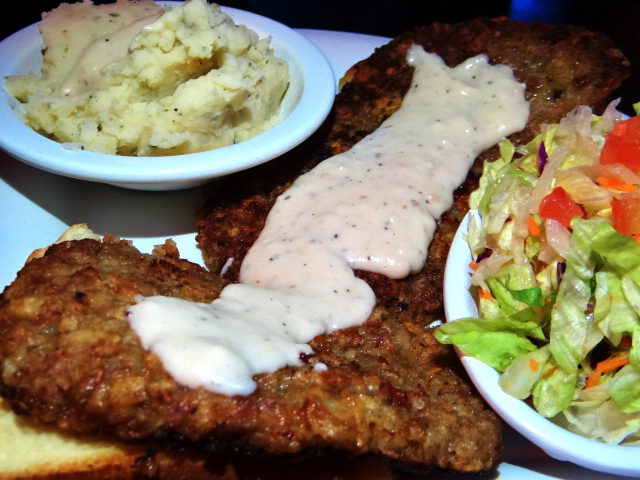 The Chicken Fried Steak is large and in charge and comes with that house-made creamed corn. There are plenty of locations around DFW to grab one of these fried steaks. Allgood Cafe has the very best Chicken Fried Steak in Dallas. There, I said it. Ellen’s Southern Cooking is located in downtown Dallas, and for visitors to the area or for the ever growing city-dwellers, this restaurant has proven to be a definite go to for breakfast. But as the name might suggest, you can find a sturdy example of a chicken fried steak and some pretty terrific gravy. And their grits do rule. Stampede 66 is the Mecca for all things Texas. The fun restaurant is adorned with kitschy Texas regalia, and has a delicious Texas themed menu replete with chili, tacos and a damned good chicken fried steak that is served with the requisite mashed potatoes and for kicks, a pea salad. Order this meal that is made with buffalo, and the table side margarita for the perfect meal delivered Texas-style. 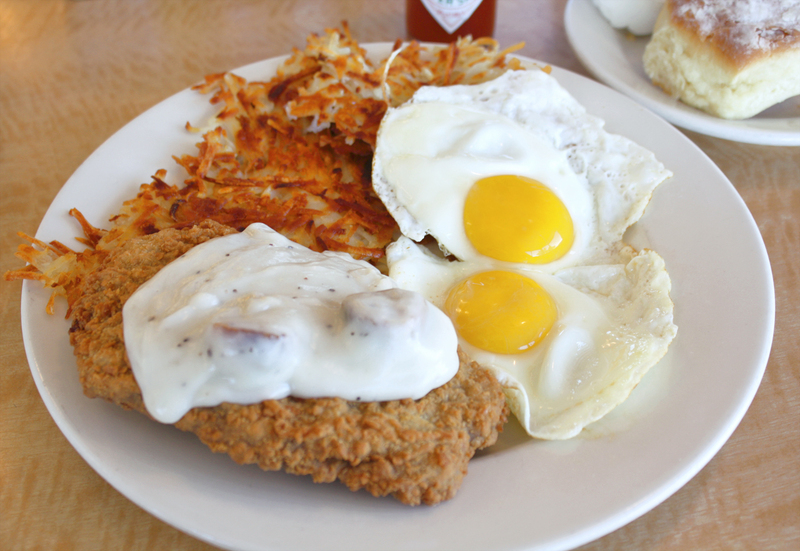 Mama’s Daughters Diner celebrates breakfast with Chicken Fried Steak and Eggs. As if gravy wasn’t enough to load you up with proper lubrication for this fried plate, the eggs also act as a self-saucing mechanism. And who doesn’t love pie for breakfast? YO Ranch is located downtown and is a send up for the famous Hill Country ranch by the same name. Here you can order some fine Texas vittles including rattlesnake chili, Elk tenderloin and a few different styles of chicken fried steak. Order it cowboy style and you will get a helping of chili with your fried meat. Ask for the Hill Country version and you will enjoy the steak with a silky smooth gravy. For kicks, YO offers a chicken fried lobster that will make your tail wiggle. Raven’s Grille rates high on our hit list for CFS in DFW. The tiny clubhouse at the Texas Star Golf Course in Euless hosts one of the better chicken fried steaks around. The steak is so large it literally hangs off the plate. At $9.95 this is a bargain that could be tackled by a pair of willing souls. You probably passed by the Old Mill Inn during the State fair of Texas, but you probably weren’t aware that this is a clearinghouse for a fantastic old-school Chicken Fried Steak. Fred’s Texas Cafe is known for their burgers, and there are plenty to choose from at Fred’s. But you might also have a larger appetite that would enjoy the sourdough battered chicken fry. So good. Button’s Restaurant is all about the southern hospitality, and this extends to their bigger-than-the plate chicken fried steak. Grab this CFS with a side of live jazz. The word legendary pops up when you chat about the chicken fried steak at the Reata in Fort Worth. This highfalutin steak is fried not only in lard, but butte as well for an ethereal kicked up flavor that will have you bragging for weeks to follow. You can also find an amazing cocktail here as well. Chef Grady Spears is the king of Chicken Fried goodness in Fort Worth, and his new restaurant Horseshoe Hill has its fair share of versions to keep any aficionado busy tasting. Located in the Stockyards, Spear’s Horseshoe Hill has five versions to keep you chewing tender fried ribeye. Riscky’s Steakhouse in the historic stockyards (can we ever say “stockyards” without the addition of the word “historic”?) lays down the law when it comes to beef, and their chicken fry is a must order at this purveyor of all things cow. We also happen to adore the pecan pie, so save room for excess. The Ranchman Café is formerly known as Ponder Steakhouse, the Ranchman offers a sublime version of the classic CFS. In a 6 or 12 ounce size. Sounds like a date to me. Feeling lucky? Order this steak with a side of calf fries for the ultimate fried experience. To find Ponder, head to Denton and take a left. Well worth the drive. 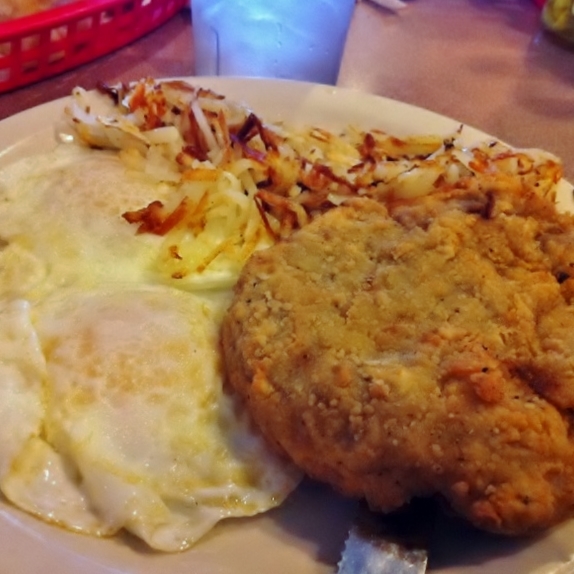 Mary’s Cafe in Strawn, Texas will always have a special place in our heart for a true pan-fried version of CFS. There is absolutely everything perfect about this steak that will take you just over an hour to devour if the winds are right and the traffic isn’t hell getting out of the city. 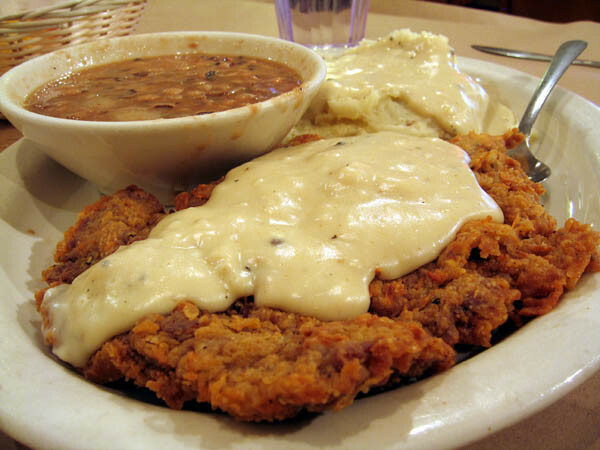 DeWese’s Tip Top Café in San Antonio cooks up a split-your-belly version of the chicken fried steak with a smooth gravy. Insist on onion rings as your side, they will rock your tongue. When in Gruene, Texas check out the Gristmill. 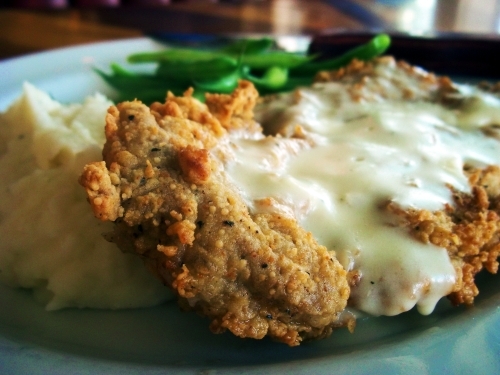 you may be thinking wurst, but the best is the chicken fried steak. Youngblood’s Stockyard Cafe in Amarillo is smack dab in the middle of the same part of the world that sued Oprah Winfrey for her transgressions against the cattlemen. Here you will find dining on the insanely delicious version of the chicken fried steak. Order the steak one of several ways, but we enjoyed the Vicki’s version with both green chile sauce and creamed gravy, with a side of cheddar mashed potatoes. Luby’s Cafeteria offers a hand breaded Chicken Fried Steak that is marginal. The breading doesn’t care to stick to the pounded beef due to improper technique, but it still has a decent flavor. My memories of Mary’s in Strawn. Great CFS ( Medium), two sides of green beans, (we didn’t know they were family style size), a tea and diet Coke…..
$42.00 – I kid you not……….